Kai Victorino, holding her grandson Alexis, has lived at Ke Ala Ho'ona in Waianae since 1995. Playing with Alexis is granddaughter Lerissa Brown as Kepa, left, Lyndel, Del and Leynna Victorino lounge on couches. 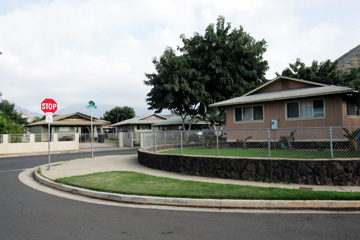 Just past Waianae Elementary School is a subdivision of 75 homes where families, some who were homeless or just one paycheck away from homelessness, can now own their own home with affordable mortgages, most under $600 a month. They used "sweat equity" to help build each other's homes and to build a sense of community. To live in Ke Ala Ho'ona, families must pledge to be free of drugs, alcohol and violence, to watch out for each other and to give back to the community. "I can't even imagine where we would be today," said Kai Victorino, who has lived in Ke Ala Ho'ona since 1995 and was in the second group of families to build their own homes. "This is probably the best neighborhood in Waianae," she said. The home she rented in Maili before she was accepted into the Consuelo Foundation program was old and had holes in the floor and walls. Drug dealers hung out nearby, and she would not let her children go outside to play. The Hawaii-based foundation, created from an endowment by the late Consuelo Zobel Alger, spends about $4 million a year on projects in the Philippines and about $1 million helping the poor in Hawaii. The idea behind Ke Ala Ho'ona is to provide a place for families to raise their children in an atmosphere of positive values so their children's children will also be brought up with the community's values, said Joey Kahala, the project manager. So far, Kahala said, it has worked. "Not one child has failed to graduate from high school," Kahala said. About 150 adults and 325 children live at Ke Aka Ho'ona, which means Spirit or Hope of Consuelo. It cost the foundation about $5 million to purchase the land and develop the project, which started in 1991. They also provide counseling and other support for the families that live there. Families watch out for each other and help each other, Victorino said. Above, a typical street in the subdivision, built through a Consuelo Foundation grant. When teenagers recently gathered in a nearby park after dark, Victorino said she threw a light on them to make sure they were not drinking or making trouble. "You need to go home," she told them. When her then-teenage son Kepa began getting into trouble, neighbors kept tabs on him, even chasing him down when he tried to run, Victorino said. With the help of the foundation, Kepa was diagnosed with bipolar disorder and given treatment and counseling. It is not easy for some families to live within the rules of the community, Kahala said. But violators could be evicted. The foundation provides counseling and other services to keep that from happening, she added. A few families have left voluntarily, Kahala said. But so far, the foundation has not evicted anyone. The last of eight increments of the Ke Aka Ho'ona was completed in 2001. There is a waiting list to be considered, if families sell their homes back to the foundation. The next step is to help others establish similar communities, Kahala said. She said the foundation is working with the Department of Hawaiian Home Lands on a self-help housing project nearby at the Freitas Dairy site. Another recent foundation project involving Hawaiian Home Lands is called Koolahou. The idea is to provide financing, job training, debt counseling and other assistance to allow selected families who live in rundown homes in Papakolea, Nanakuli and other home lands to tear down their houses and build new ones, said foundation Director Patti Lyons. The foundation is paying for schooling and, in one case, even new dentures for a client so that they can get better jobs and afford a safe home for themselves and their children, she said. "We try to get them to work for themselves," Lyons said. "We don't like dole-outs because dole-outs don't work."